The best place I've found to satisfy a sweet tooth is at the Highland Maple Festival in scenic north-central Virginia, where you can tour five maple-sugar camps. It's fun to watch the “sugar making” process from tapping the trees to bottling the syrup. It harkens back to a time when “opening” the trees and boiling down the sugar water put “tree sugar” on virtually every table in the area. 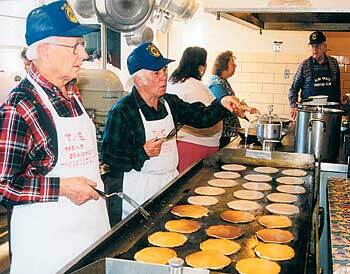 But it's even more fun to taste the finished product at buckwheat and pancake breakfasts and in maple doughnuts. Other highlights of the festival include bluegrass music and clogging and an arts-and-crafts show. Known as “Virginia's Switzerland,” Highland County adjoins the West Virginia state line; U.S. Highways 220 and 250 are its major thoroughfares. The Highland Maple Festival takes place on the second and third weekends of March (that's March 11-12 and 18-19 in 2006), with tours and other events held throughout the county. For detailed information, call the Highland County Chamber of Commerce at 1-540-468-2550.